Horses are non-ruminant herbivores with rather small stomachs that have a capacity of only 2 to 4 gallons. This means that most of the digestive process takes place in the hind gut. This digestive process evolved over thousands of years and worked very well for an animal that grazed most of its waking hours. A sudden change in appetite or the way of eating indicates that something is wrong with the horse or the feed. When horses became domesticated, their lives changed drastically. From eating many small amounts frequently while grazing, horse's now had work schedules and became dependent upon owners for their feed--usually at the owner's convenience. When a horse eats, the feed passes into the stomach which secretes digestive juices to begin the breakdown of the food; then it passes into the small intestine where most of the nutrients are digested and vitamins and minerals are absorbed. When a large volume of feed is ingested rapidly, the stomach is forced to to pass the feed into the small intestine before the feed is acted upon by the stomach's enzymes. This interferes with total digestion and proper utilization of feed. Once the feed has been acted upon by the digestive juices in the stomach, the remainder of the meal passes into small intestine and then into the cecum where toxic substances are detoxified and fiber and other soluble carbohydrates are digested further, aided by bacteria and protozoa, with the end products of digestion being absorbed and entering the blood stream. The remains of the ingested meal consist mostly of fiber and roughage which then moves through the large intestine with the indigestible parts of the meal ending up as manure. The most basic nutrient - water! The horse's digestive system needs about 10 gallons of water each day to process the forage consumed. Water leads the list because it is the most important nutrient and without it a horse cannot survive very long. Most horses require about 2 quarts of water for each pound of hay consumed. During hot weather, hard work and lactation, the water requirement may be 3 to 4 times the normal consumption. It is extremely important that all horses have access to a plentiful supply of clean, fresh water on a daily basis. Adequate water enables all bodily functions to occur as nature intended. When deprived of water for 2 days, a horse generally refuses to eat and may show signs of colic. 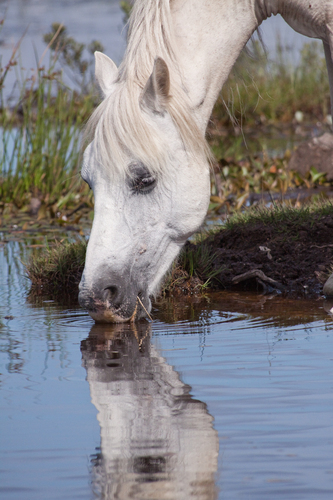 Horses should be allowed to drink as much as they want except immediately after exercise, when it is important to restrict water until the horse has a chance to cool down. Carbohydrates are the main source of energy in most feeds. Soluble carbohydrates such as starches and sugars are easily broken down into glucose in the small intestine and insoluble carbohydrates such as fiber or cellulose are fermented by bacteria and protozoa in the intestines to release their energy sources. Soluble carbohydrates are found in nearly every feed source for horses. Corn, barley and oats are highest in amounts with forages normally having only 6 to 8 percent starch, but may contain as much as 30 percent. Protein is necessary for healthy muscle development during growth and exercise. The main building blocks of protein are amino acids. Most adult horses require only 8 to 12 percent protein in their ration, but a higher level of protein is important for lactating mares and growing foals. Alfalfa and soybean meal are good sources for protein that can easily be added to your horse's diet if necessary. Protein deficiency depresses metabolic activities causing the horse to become lethargic and mentally dull. The hair coat becomes rough and coarse and performance decreases. In severe cases, the horse becomes anemic, exercise intolerant, refuses to eat and appears unthrifty. Horses don't have a gall bladder which makes high fat diets hard to digest. Although most feeds contain less than 6 percent fat, this appears to be adequate to meet the nutritional needs of most horses. Research has found few or no indications of any fatty acid deficiency in horses studies. In cases such as show horses or where a glossy hair coat is important, the addition of 1 to 2 ounces of any polyunsaturated plant or vegetable oil added to the horse's ration twice a day usually improves the appearance of the hair coat. At least 21 minerals are required in the horse's diet. Provided that average or better quality feeds are used and trace-mineralized salt is available, horse's very seldom have mineral deficiencies of any note. In some areas, the soil in which feed is grown is deficient in one of more minerals resulting in feed that may also be deficient in minerals. These areas are well known and you can obtain information about the mineral composition of soil where you live through your local extension service. Horses do have a natural craving for salt and an adult horse at pasture will consume about one-half pound of salt per week with horses in training and lactating mares consuming more. Lack of salt causes decreased appetite and weight loss and may be responsible for a tendency for horses to lick at urine or eat dirt and manure. Most forages do not supply adequate salt for the horse. In nature, horses find salt-rich mineralized areas to meet their need. 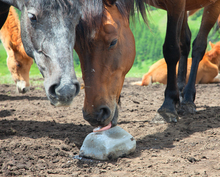 In your pasture or stall, an inexpensive salt or mineral block is required. Horses will usually consume only the amount of salt needed and salt toxicity seldom occurs unless water is restricted or if a horse drinks salt brine without having access to adequate clear fresh water. Horses sometimes suffer from calcium or phosphorus deficiency especially when growing, pregnant or during lactation. When a deficiency occurs, it is best to give the minerals directly to the horse rather than allowing free choice such as with salt. Your veterinarian is your best source of information as to whether or not your horse needs mineral supplements. While a varied and planned diet provides adequate vitamins and minerals for the typical horse - younger, older, sick and working horses may require a supplement to satisfy their metabolic needs. Vitamins are organic substances required in small amounts for normal body metabolism. A healthy digestive tract will manufacture water soluble vitamins including the B vitamins and vitamin C. Fat soluble vitamins are supplied by the feed the horse eats except for vitamin D which comes primarily from exposure to sunlight. 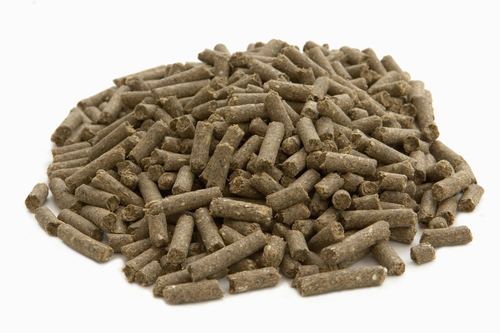 Vitamin A is the only vitamin that may be inadequate in feed routinely fed to horses. A deficiency of this vitamin makes a horse more susceptible to respiratory and reproductive tract infections and may cause infertility problem. Vitamin A is also important for proper functioning of the horse's eyes and a deficiency can lead to night blindness and excessive tearing. The best sources of vitamin A are rapidly growing spring and early summer grasses that contain a high level of carotene which is converted to vitamin A in the horse's body. When poor-quality hay must be fed for a period of time or when pasture is not available, the addition of vitamin A to the horse's daily diet is important. Supplements containing vitamin A are available at all feed stores, or your veterinarian may give your horse an intramuscular injection of vitamin A that is good for around 3 months. Vitamin E which, along with selenium, enhances the horse's immune system has been noted to be deficient in some horses, especially those that have limited access to fresh green feed. Vitamin E deficiencies have been linked to many problems including muscle disease, neurologic conditions and reproduction problems. Wheat germ oil and alfalfa meal are excellent sources of vitamin E for horses. In addition to these six nutrients in the horse's diet, a certain amount of fiber is important for proper digestion. This requirement is usually met by hay and most forage. Horses usually prefer feed to which they are accustomed. When new feed is introduced or changes must be made, it is best to go slowly and gradually make the changes over a period of several days. 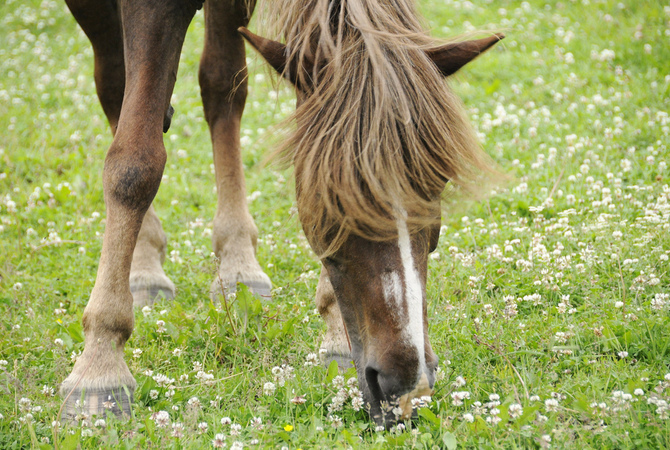 Careful attention to what your horse eats and the manner of eating is important. A sudden change in appetite or in the way of eating may indicate that something is wrong with the horse or the feed. Careful observation of your horse on a daily basis is important to its over-all health and well being.